Rich in flavor, this small stuffed dumpling can be served as an appetizer or a main dish accompanied with a favorite dipping sauce. In a bowl, combine cilantro, scallions, ginger, sugar, jalapenos and lime juice with softened cream cheese. Add crab mixture and lightly mix with other ingredients. Using wonton wrappers approximately 4 inches square will work to make smaller dumplings for appetizers. However, if a larger dumpling is preferred, a 4 x 6 inch rectangular wrapper can be made from spring roll dough sheets. Use an 8 inch square spring roll dough sheet to begin. Cut two rectangles from each 8 inch dough sheet and there will be 2 inches of dough as excess. Lay wonton wrappers on a flat surface and add a teaspoon of crab filling in the center of the wrapper or adjust amount depending on size of the wrapper. 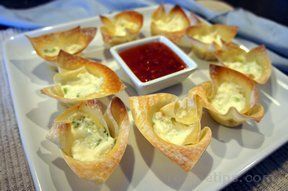 Lightly and evenly spread the filling into a coin-shaped portion making sure to keep it well away from the outer edges. Dampen the edge of each wrapper with water and fold in half, resulting in a rectangular shape to the wrap. Dampen the edge of each wrapper with water or a lightly beaten egg and press the edges together so they seal the contents. As they are sealed, press the excess air out of the wonton to keep the wonton from puffing up as it cooks. Fold the wonton lengthwise in half again, creating a somewhat narrow rectangular shape to the folded dough. Moisten the edges again if necessary so they adhere better. Fold each end in toward the center of the wrap, allowing half of the end to remain in a vertical position while the other half is folded over on top of and overlaps the opposite side end piece, like the end corners of an envelope. Press the ends together that overlap, so they adequately seal. 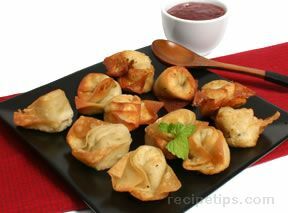 Keep the filled wontons covered with a damp cloth to retain the moisture in the dough while others are being filled. 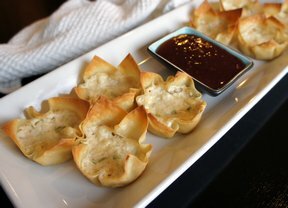 When ready to cook, place the filled wontons on a baking sheet layered with parchment paper. 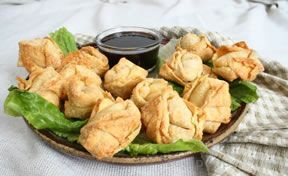 Fry wontons in small batches for 3 to 4 minutes each until they are light golden brown. Remove and place on paper toweling to absorb any excess grease. Use a sweet and sour sauce and a hot mustard sauce to provide two choices for personal tastes.